Dubbed “The Tiger of Kai” (Kai Province), Takeda Shingen was a legendary military strategist during the Sengoku Jidai (戦国時代), the Civil War Period of Japan that lasted for a century. Born as the eldest son of a clan boasting descent from the legendary Minamoto clan, he studied Buddhism and received lesser ordination in 1559. “Shingen” was the name given to him by his Buddhist master, and by this name, he would be known throughout Japan. The Sengoku Jidai was a vicious age where son struggled against father. In Shingen’s case, he not only struggled; at the age of 21, he overthrew his father, Takeda Nobutora, in a bloodless coup. This was said to preempt his father’s making the second son heir instead of Shingen. Nobutora was forced into retirement on the southern border of Kai province under the watchful eye of the Imagawa clan, which had assisted in the coup, and with which Shingen formed a formal alliance. Shingen launched a campaign of regional expansion, carving out victories against the Murakami clan of Shinano province despite a loss at Uetahara where he lost two of his own generals. Pushed out of Shinano, the Murakami placed themselves at the mercy of the lord of Echigo, who underwent several name changes during his own Buddhist studies, becoming known to history as Uesugi Kenshin, “The Dragon of Echigo,” who would become Shingen’s celebrated rival. Even amidst a nation in a near constant state of conflict, this feud would prove to be a long series of chess matches between two remarkable military strategists. A series of five battles, fought over a course of eleven years, occurred at the same location: Kawanakajima, a plain at the northern end of Shinano, forming the south of modern-day Nagano. Neither strategist placed all his eggs in one basket, constantly seeking a decisive opportunity to attack while denying the opponent a similar opportunity. During the fourth battle, a miscommunication was said to have caused Shingen’s bodyguards to have separated from him, allowing Kenshin an opportunity to personally decapitate his opponent (figuratively and literally). Charging on horseback, Kenshin personally attacked Shingen – sitting on a commander’s chair with his war fan, a traditional signalling device for leaders – with his own sword. Shingen used his own war fan (reinforced with metal) to parry the blow. Soon after, Shingen’s bodyguard caught up and, despite a sharp engagement, both Shingen and Kenshin lived to fight another day. In 1560, Shingen’s ally Imagawa Yoshimoto died in a shocking reversal of fortune against Oda Nobunaga, a fearsome young warlord whose name would be engraved on the wooden block of Japanese history. Shingen moved to seize lands from Yoshimoto’s son while successfully fending off Uesugi Kenshin. During this time, Shingen also oversaw the damming of the Fuji river, one of the main acts of civil engineering of the era. Fending off an attempt to interfere with his expansion by the Hojo clan, Shingen gained firm control of the lands he had targeted by 1569. By this time, the rise of Oda Nobunaga had been great indeed, and Shingen was one of the few warlords with the power to challenge the Oda-Tokugawa alliance that was threatening to take over the entirety of Japan. 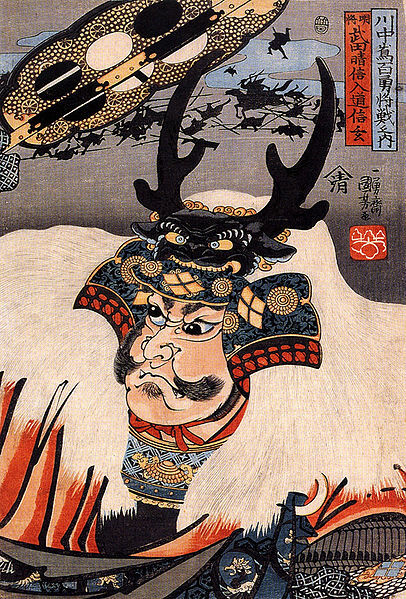 Shingen invaded his enemies’ territory in 1572, but perished while at camp during the campaign. The exact cause has been lost to history and swamped by speculation. Some say he died of an old war wound; some say a sniper shot him; others still say he died of pneumonia. The Tiger of Kai died at the age of 49, leaving a legend that would long outlive him. In honor of his longtime foe, Uesugi Kenshin ordered a period of mourning for three days, and refused all entreaties to launch an attack to exploit the situation. Kai Province boasted arguably the finest cavalry of Japan. Shingen used this cavalry in accordance with these principles, seeking to move swiftly, to conceal his movements until the decisive moment, attack the opponent’s weak point with decisive force, and, when compelled to defend himself, to be as difficult to dislodge as a mountain. Truly, to call him the Tiger of Kai was no empty compliment. This entry was posted in Japanese and tagged bushido, culture, history, Japan, samurai, Shingen, Takeda, tora. Bookmark the permalink.